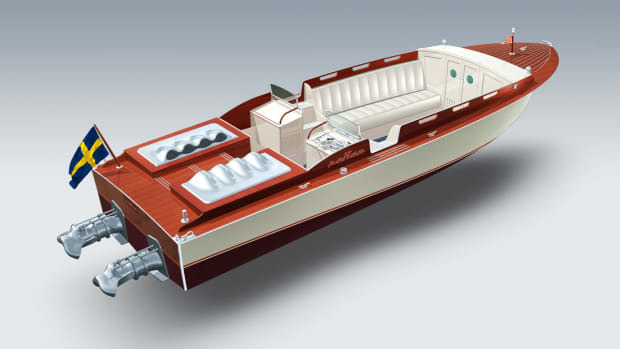 With inventive solutions for performance and comfort, the Wajer 55 sets a benchmark in her class. It’s a glorious, sun-drenched afternoon in Holland as we traverse the charming little canals outside of Amsterdam. 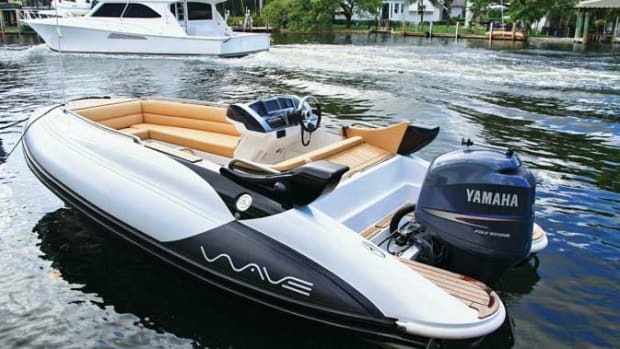 Our ride, a Wajer 55, feels anything but little. 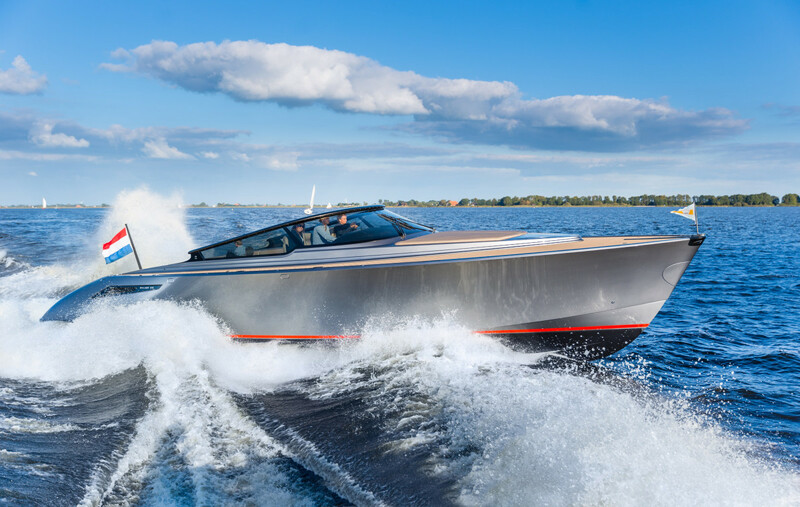 In fact, she’s the largest powerboat from the Dutch yard Wajer Yachts, and our chauffeur—the yard’s commercial director, Dries Wajer—is excited to show her off. These winding waterways are pure postcard material, but I’m struggling to see anything past the shimmering craftsmanship of the boat, which daintily zigs and zags without spilling a drop of the Heineken in my hand. 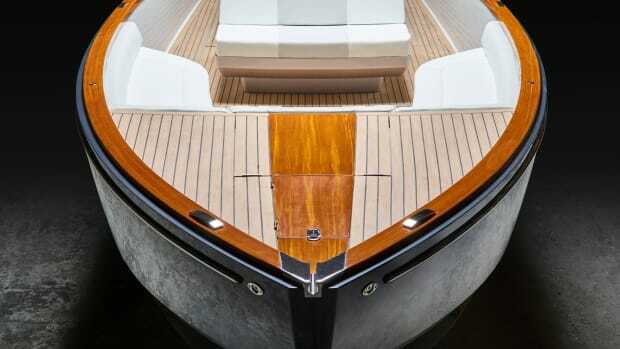 Coming hot on the heels of the yard’s award-winning 37- and 38-foot (11.2- and 11.5-meter) models, the Wajer 55—a collaboration between Vripack and Sinot Exclusive Yacht Design—resumes the arm-wrestling match between performance and comfort to define the line’s standout attribute. The answer, according to Wajer, is both. 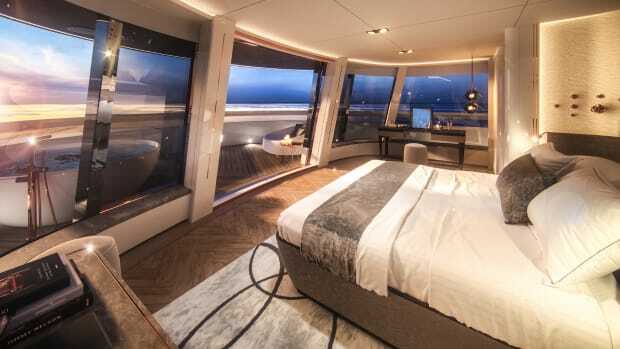 Cruising at around 25 knots with the breeze playfully tousling my hair, my time aboard affirmed the builder’s promise of bringing owners closer to the sea and enhancing the onboard experience. 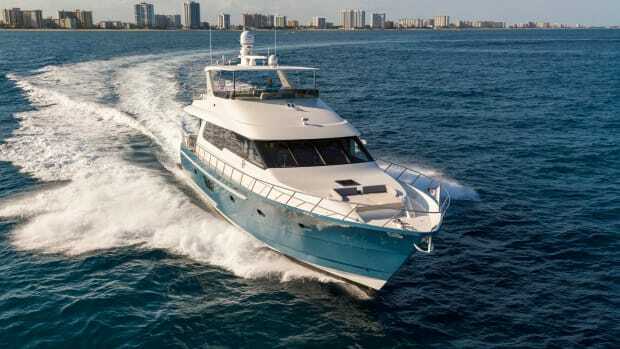 This 55’s helm has four cushy captain’s chairs with custom suspension, and a Raymarine Glass Bridge with four touchscreens, all part of an intuitive system. The console can be brought forward, and the movable cockpit sole can be raised or lowered for better views and protection against the elements. The nearly 13-foot-wide (3.9-meter) wraparound windshield made of tinted glass—a Wajer trademark—helps keep skippers dry, too. 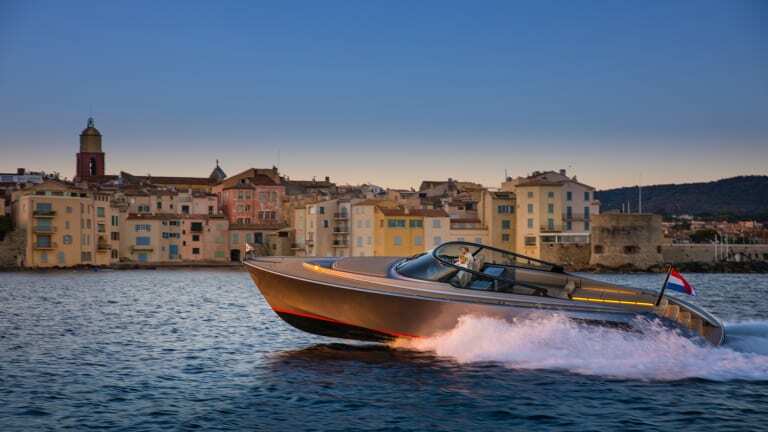 Well protected by Wajer’s trademark wraparound windshield, the helm has four captain’s chairs with custom suspension and four sizeable glass-bridge touchscreens. Don’t be fooled by her quiet air of luxury. The Wajer 55 is also every bit of a performance machine, especially when ripping along at her 38-knot top end. She was built for maneuverability and comfort. Her V-design hull, courtesy of Vripack, is well balanced, while inventive spray rails add to the dry ride. Weight savings come from lightweight materials and vacuum technologies. The 55 is one of few yachts in this category to offer a triple 435-horsepower Volvo Penta IPS600 package. 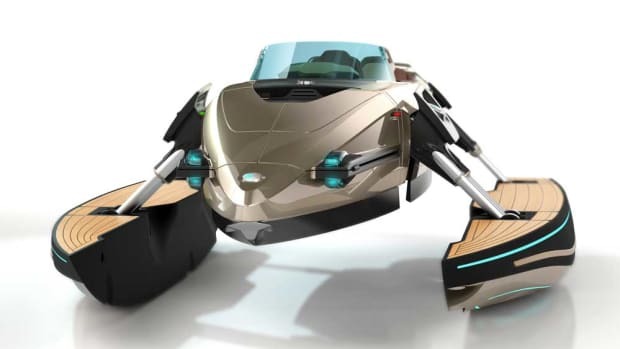 The engines, which can be operated via joystick, are compact enough to leave space in the boat’s after section for a Williams Turbojet 325 tender, whose 10-foot, 9-inch (3.3-meter) length is concealed below the sun pads. 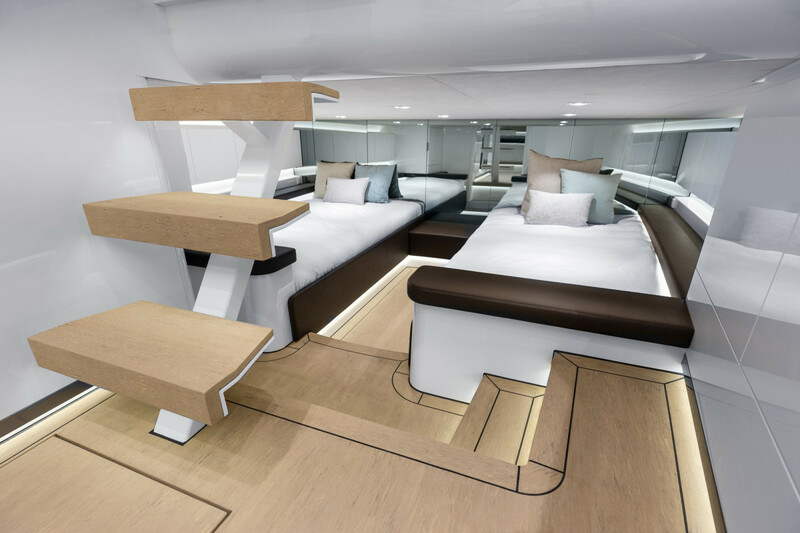 Down below, creature comforts include a galley, day head and accommodations for six with a skylight above the cabin. 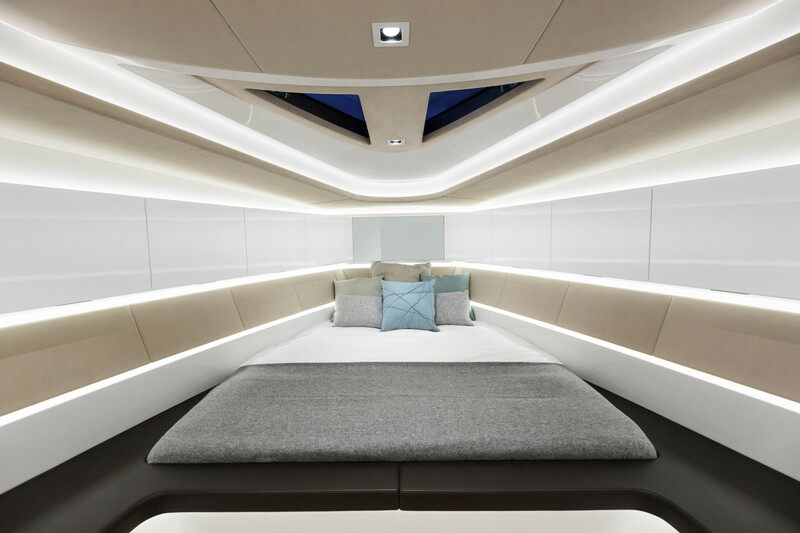 Within the 55’s inviting contemporary interior are a galley, a day head and accommodations for six. Note the skylight above the forward berth. For me, the coolest novelty on board is the push-button fender system, which has fenders popping out from the side and inflating automatically. It can be operated remotely or from the console touchscreen. 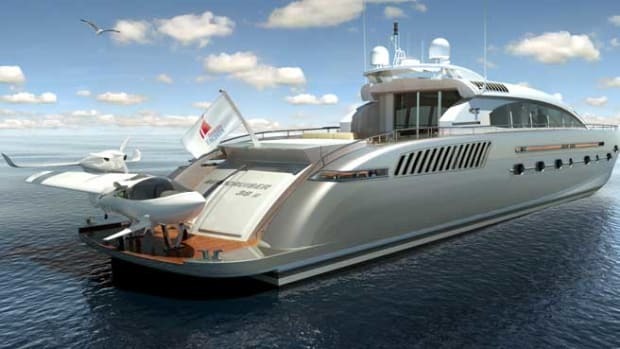 I’m told that Wajer Yachts is the first to employ such a system on a yacht smaller than 60 feet long and has a patent pending. Equally cool is the hydraulically operated anchor, which also can be operated via touchscreen. Aided by a camera, the system eliminates the need to brave the elements while anchoring. The swim platform that doubles as a gangway. At 6 feet in length, the passerelle is wide enough for several people and adjusts to the height of the quay. 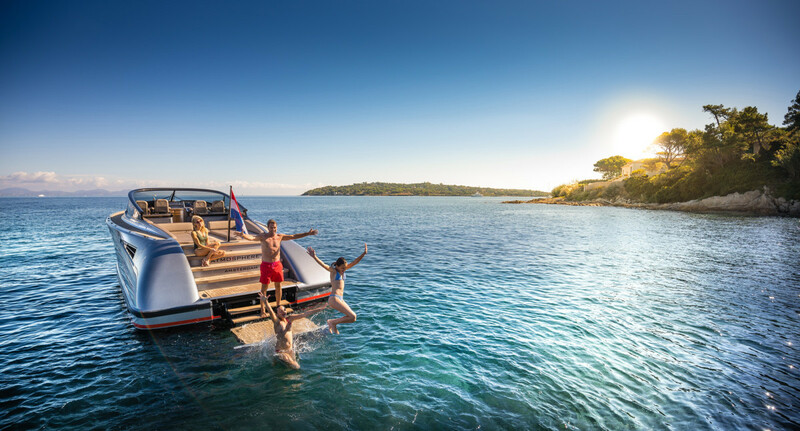 Wajer’s innovations continue with an automated Bimini top/spray hood that retracts into the aft seating area; a cockpit table that hydraulically lowers into the sole, freeing up cockpit real estate; and a swim platform that doubles as a gangway. At 6 feet in length, the passerelle is wide enough for several people and adjusts to the height of the quay. My ride ended with the vibrant Amsterdam waterfront approaching and the last few drops trickling from my bottle of Heineken. I was reminded that it’s not every day one gets to arrive in such grand fashion. Hopefully, it’s not the last.